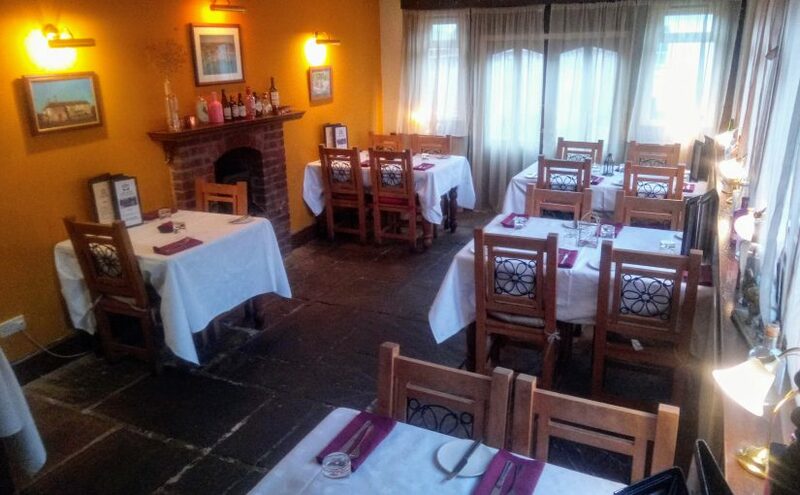 Our kitchen aims to provide the best in carefully sourced and well cooked food. Breakfast, lunch and dinner menus are supplemented with a selection of home made cakes, stone-baked pizza and other lighter options on our menu. Ingredients come from local farms and suppliers wherever possible. The Breakfast Menu, currently served 8.30am until 10.30am every day, but until midday on Saturdays, features a Full English breakfast, bacon, egg and sausage cobs, and delicious creamy porridge. If you really need a boost to start the day, get the “Croxton Farmer’s breakfast” – two eggs, two rashers of Ancaster smoked bacon, two David Cox Lincolnshire sausages, mushrooms, tomatoes, black pudding, baked beans and fried bread. Our main “pub classics” menu has a combination of classic pub meals (fish and chips, sausage and mash, pie of the week), light snacks (honey roasted baby chorizo, pork pie), soup and other starters (our fishcake with pernod cream is a favourite), filling sandwiches and a hearty ploughman’s lunch with local meats and cheese, a selection of toasted panini on our very own ciabatta, and smaller dishes such as quiche, fries and salad, a cheese or charcuterie board, or butterfly chicken breast in a home-made brioche. In the evenings, the pub classic menu is served alongside our pizza menu and the daily specials – these typically include sirloin, rump or hanger steak, fresh egg tagliatelle or gnocchi, seasonal meats, selected fish and vegetarian dishes, along with a selection of hand-made pizzas. Desserts always include our very own ice cream (made using cream from Belvoir Ridge Creamery just a couple of miles away), and often feature warm chocolate brownies, orange or lemon possets, home made meringues and cheesecakes, and our cheeseboard of award-winning local cheeses. Most of our dishes can be served in smaller portions for children, or those with reduced appetites. We do also have a specific children’s menu. Fish goujons (100% haddock), chicken goujons (free range chickens from the Botterills, naturally), spaghetti bolognese and our signature David Cox sausages all available with fries and a choice of peas, sweetcorn and baked beans. We strongly believe kids’ food can be great food. Sunday lunches (see a sample menu from April 2018) are served from 12 midday until 3.00pm. Each week we will have a choice of locally reared meats and a vegetarian option, all served with traditional accompaniments (roast and mashed potatoes, Yorkshire puddings, gravy and a choice of seasonal vegetables). On Sunday evenings we have live music between 5pm and 7pm, and while you’re enjoying the music we offer a ‘Sunday Suppers‘ menu including pizzas and a range of simple yet filling dishes to round off the week. Whether you’re looking for a light snack or a full meal, we have something to tempt you and satisfy your cravings. Call us on 01476 870350 to reserve a table. Reservations are recommended.